Since the beginning of my BeautyMarkedMom journey, my posts have been focused on developing your inner beauty and taking time out for yourself on the "Do You!" page. Today, I'm excited to share my first post on style & fashion. For those of you that don't know me well (yet), I am the ultimate bargain shopper and love putting together outfits according to my ever-evolving personal style. I never ever ever pay retail price for any of my clothes, my husband's clothes or my daughter's clothes. My mom taught me a long time ago how to shop for stylish, designer clothing and only pay a fraction of the cost. My motto/goal when it comes to shopping is this: "Buy the most stylish, well-made item for the lowest possible price". That's just how I roll! Not only is it extremely cost-effective to bargain shop, but it's also extremely fun!! Especially when you see that item that you've had your eye on for weeks finally go down to the perfect price. Ahhhh, what a feeling :). This past weekend I got a chance to go shopping at Target and Marshall's, two of my favorite stores, to find great deals on stylish pieces. On Saturday morning I received my monthly Target mobile coupons, which I tweeted to all of my twitter followers (share the love, right?! ), and saw that there was one for $3 off any Merona women's item over $10. Now, this coupon was valid on even Merona items that were on sale, so I was too excited to head to Target & see what I could find. When I got to the store I scanned the full-price racks on my way to the sale section. Didn't see anything I couldn't live without. Then I looked thoroughly through the 50% off, 75% off and finally the 30% off racks. In that exact order. (The 30% off rack is a last resort because I've noticed that the items there end up getting marked down to 50% in a few weeks so I just wait it out). 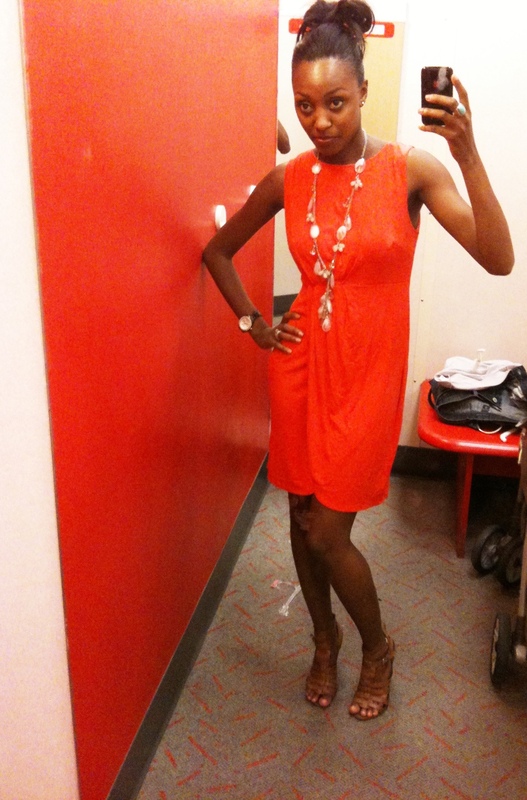 Anyways, I found a beautiful coral dress that zips up the back & ended up only paying a whopping $9.00! Shopping testimony! Holla if you hear me! I was so excited. The item was originally $24.99 so I think it was a great deal. And with the whole outfit put together with my Nine West gladiator wedges, Ann Taylor Loft necklace & rose gold stud earrings (I LOVE rose gold), I know that I purchased a quality piece to add to my summer wardrobe. And I have something cute to wear on my next date night! So, since you've been so kind as to read my entire post, you know I've gotta share the love and jump-start your week with some coupons! Here are a few Target mobile coupons that you can redeem using the barcode right from your smartphone! Have a wonderful week and please stop by and share your shopping testimony! Emonne Markland: Leave YOUR Beauty Mark!